You’ll get no arguments on that front here. But the second-most wonderful time of the year arrived on Wednesday, November 7. That’s because on November 7 the deluge of midterm political TV ads, billboards, mailings, robocalls, etc. … all came to a screeching halt. Finally, some peace and quiet (at least until the 2020 presidential run starts next year). Oddly enough, Congress also came to a screeching halt in the wake of the midterm elections … or at least it will when the Democrats take over the House next year. Congress is now divided, with the Democrats in control of the House, Republicans holding the Senate and President Donald Trump presiding in the White House. This means gridlock in Washington, D.C., with neither side willing to come to the table and compromise. Judging from the post-election rally in the markets, Wall Street is finally glad for a direction in D.C., even if that means no direction. But there is one sector that should benefit more from being left alone than the others. One sector where less meddling from a well-meaning Congress should provide a lift instead of stagnation. That sector is health care. Since taking control of all branches of the U.S. government, Republicans have tried everything in their power to repeal the Affordable Care Act (ACA). With Democrats now in control of the House, attempts to repeal and replace the ACA (or Obamacare) will end. The same goes for other so-called “entitlement” health care programs like Medicaid and Medicare. Whether you agree with this raft of health care legislation or not, it has been central to lifting all boats in the health care sector. With roughly 20 million newly insured on the insurance rolls, it would have been hard for the health care sector to not gain considerable ground. And considerable it was. 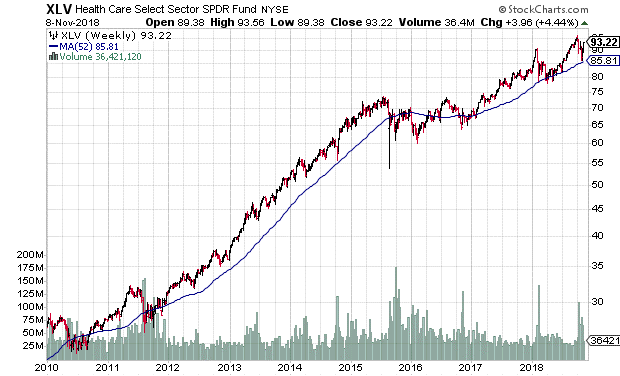 Since the ACA went into effect in 2010, the Health Care Select Sector SPDR ETF (NYSE: XLV) has rallied nearly twofold. As you can see from the chart, XLV soared higher during the Obama administration as the ACA took effect. The health care exchange-traded fund (ETF) then stalled in 2016 as it became more likely that a Republican would take the White House. Growth in health care stocks since Trump took office has been nowhere near as robust, as the administration undermined policy that bolstered health care profits. My point isn’t to take political aim here; I’m not taking sides. What I want you to see is the significant investing opportunity that lies ahead for the health care sector. With gridlock now the norm on health care policy in Washington, D.C., companies in the health care sector can more accurately plan and project profits for at least the next two years. 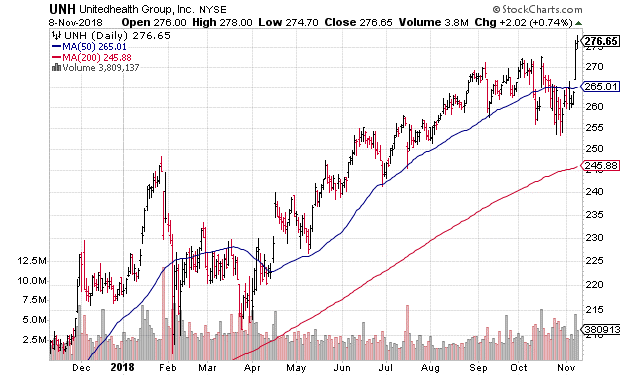 Stock in health insurance companies, like UnitedHealth Group Inc. (NYSE: UNH), soared following the midterm results. UNH hit a fresh all-time high, and should continue to gain ground now that the company no longer has to worry about shifting government policies. Pharmaceutical companies, too, stand to benefit from stagnation on health care policy in Washington, D.C. While Democrats have historically taken aim at drug makers for excessively high profits at the expense of patients, Republicans will keep any such moves in check. Pfizer Inc. (NYSE: PFE), a perennial whipping boy for the Democrats, has the best of both worlds now: No changes to health care policy from the Republicans, and no changes to drug prices from the Democrats. While its relief rally last week wasn’t as sharp as UNH’s, PFE stock has plenty of upside potential amid the Washington, D.C., gridlock. 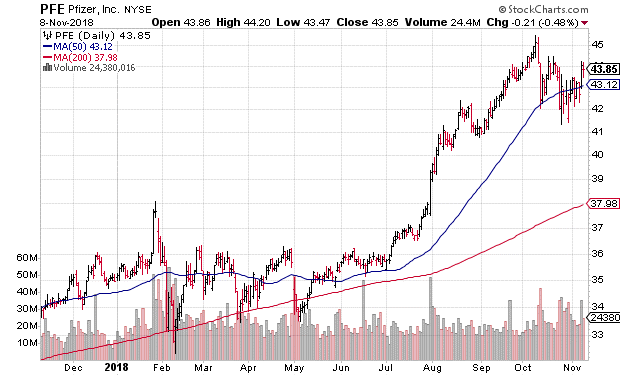 Finally, health care consumer goods companies like Johnson & Johnson (NYSE: JNJ) will likely be among the strongest performers over the next couple of years. Not only does JNJ benefit from the lack of action on health insurance, Medicare and Medicaid and pushback from Republicans on drug price regulation, it also benefits from being a part of the consumer goods/essentials market. As my colleague Ted Bauman has pointed out several times, a divided Congress may lack the ability to deal with any economic crises that arise over the next couple of years. In other words, the likelihood of an economic downturn heading into 2020 has increased with the midterm elections. And during periods like these, consumer essentials are among the last sectors to take a hit — making them excellent defensive plays. That means additional benefits from investing in JNJ stock even if the bull market begins to stall out. 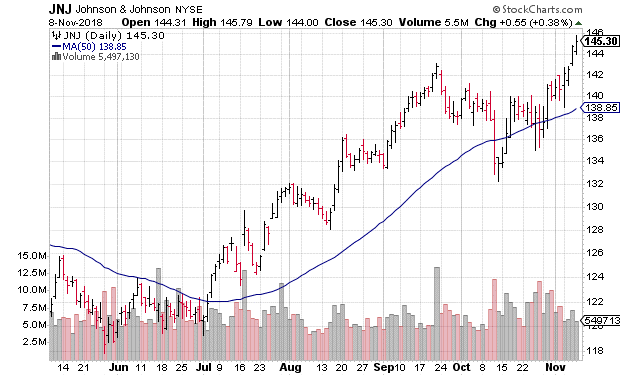 And if you’re looking for short-term gains, JNJ stock is emerging from a cup-and-handle formation that could see the shares move sharply higher heading into the end of the year. Remember, as investors, it’s important to set our opinions on political policy aside, look at what is and react accordingly. You may not agree with one side or the other (or either for that matter). But we can all agree that we need to take advantage of the situation to improve our financial standing and grow our wealth. At the end of the day, your family’s financial well-being is what matters most.